Find the level of online weight loss support that's perfect for you. How do you know which is the best weight loss program for you? Read the product descriptions and recommendations below, and if you still have a question you can always contact me HERE. 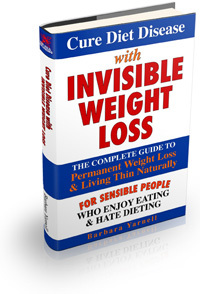 Cure Diet Disease With Invisible Weight Loss (eBook) is a 292 page "how to" instruction manual for lasting weight loss and living a naturally thin life. Professionally edited with complete table of contents, index and comprehensive resource list. A genuine healthy diet plan that gets fast weight loss results when followed. Detailed information about Cure Diet Disease With Invisible Weight Loss can be found HERE. What's required for a diet to work? Five hundred ten (510) weight losers reveal what's necessary for a weight loss effort to succeed. 10 Reasons Why Your Diets Fail Review these startling facts and diets will NO LONGER control your life. A Healthy Diet Plan As Sensible As It Is Effective -- The easiest, safest, most effortless and sensible weight loss plan on Earth. You can begin losing weight sensibly at your next meal. How To End Food Cravings Today -- Understand the five causes of cravings and it's easy to eliminate them. My clients rarely experience food cravings, find out how they do it. How To Restore Self-Confidence So You Can Succeed -- The biggest obstacle for many overweight folks is the absence of self-confidence. 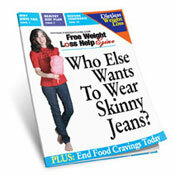 I show you an easy way to revitalize confidence so you can lose weight and get on with your life. If you haven't subscribed yet, you can do it HERE. Have a weight loss question that's preventing you from losing and keeping weight off? Ask it here, free. I will tell you what has worked for my successful clients. Or browse the questions others have asked to find your answer. Go to HOME PAGE for more about your healthy diet plan.